Crank up the thermostat with this blend of dancehall, U.K. rap, soulful vocals, and bubbling club energy. Swing Ting, the Manchester party-turned-label, will celebrate a decade in the good-times game in 2018. Founders Samrai and Platt told us Swing Ting's behind-the-scenes story back in 2015, and followed it up with a string of fire releases that won them label of the year recognition from FACT in 2016. To see out their single-figure years, Samrai and Platt have made us a FADER Mix that encapsulates the spirit of Swing Ting. Dancehall rubs shoulders with U.K. rap; bubbling club sounds brush up against soulful vocals. In short, it's a blast, and one that's sure to crank up the thermostat on these sharp, wintery days. 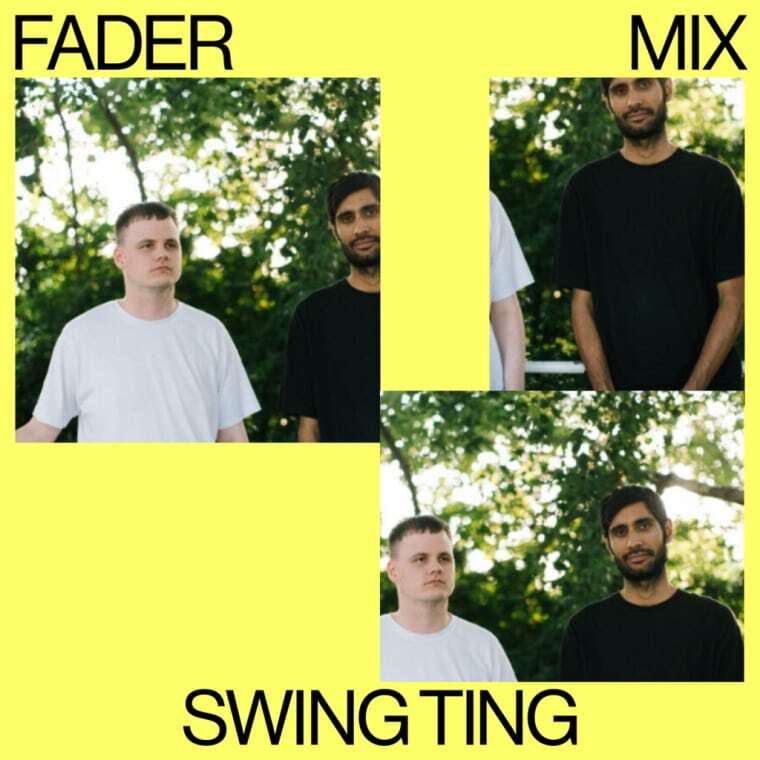 Listen below, and scroll for details of Swing Ting's upcoming Junction EP (pre-order it here) plus two of the best recipes to grace the FADER Mix series. We’re in a studio in an old mill in Ancoats, [Manchester] with no windows. It’s chilly around this time of year but we’ve got the layers and heaters on! Tell us a bit about this mix — what shaped it? Samrai: It’s a little more of a soulful selection based around recent projects tying in a few personal favorites. Platt: We tried to take a step away from the club with this one. There’s a few forgotten gems in there too. Samrai: Playing around on my mum’s stereo. Michael Jackson’s Dangerous was in the tape deck! Platt: Running around Huddersfield Carnival as a toddler to watch my dad’s steel orchestra. Swing Ting will turn 10 in 2018. How has it evolved over the years? Samrai: Can’t believe it’ll nearly be a decade. It started out as a small party to push sounds that weren’t always getting as much play in the clubs. It’s stayed pretty similar whilst incorporating new styles that have emerged. Joey B, Fox, and Murlo joined the crew and we’ve expanded to include a label arm which has helped to tie the events to a sound and the sound to events we play. More recently it’s been a real honor to showcase what we do on the road. Platt: It’s all got a bit serious! We’re lucky in that we’ve got a crew of people and friends that we collaborate with, whether they’re working on music, artwork or events that help to make everything super fun, even though we’re still figuring out everything as we go along. I think in terms of sound, things have got a little more focused — we know what fits in with the ST sound, even though we can’t fully articulate it half the time. What's your favorite Swing Ting memory? Samrai: Playing Unsound electronic music festival in Poland last month was a real honor. We weren’t sure how our set would be received but everyone seemed clued up and down to party — before we knew it, hours had passed. We successfully managed to haggle an extra 10 minutes from the stage manager! Club-wise, one of my faves was when Hipsters Don’t Dance played at Soup Kitchen for the first time alongside Brackles and Murlo in February 2014. Fox was hosting, as always on fine form. It wasn’t the busiest party which left plenty of dancing room as the vibes and energy were electric! Everyone at that one still reminisces about it fondly. Platt: This is going to be way too hard to choose. I think Outlook this year was pretty symbolic of how far we’ve come — getting to run both a boat and a beach party for our first year at the festival was a huge privilege. In terms of the club, the first time Equiknoxx played was really, really special. I remember getting emotional hearing them play "Sky Daggering," which is never something I’d imagine myself saying. Any projects coming up that you'd like to share? Samrai: We’ve got an EP, Junction, coming out on 1st December — it features collaborations with loads of our favorite vocalists recorded between 2015-2017. A few of the tunes in this mix are on there. Platt: The Junction project has been in the works for over two years, it’s so exciting to be finally getting these songs out there. Label-wise, we’ve got a few things to get out before the end of the year, but we’re mainly working towards our 2018 catalogue. Samrai: Colson Whitehead’s Underground Railroad and Marlon James’s The Book of Night Women are beautifully crafted novels. Both explore stories that aren’t usually told and made me contemplate the struggles endured by people of color. They felt particularly pertinent and made me appreciate the freedoms we enjoy. However we can’t get complacent as these can be swiftly removed especially given the current rise of far right politics. Platt: I recently revisited Geoff Dyer’s The Colour of Memory, which used to make me feel as though I’d missed out on a golden era of creativity in Britain. Now looking through a different lens, I feel like we’re in the middle of a new one — although one where nobody’s really quite figured out how to make it work yet. Samrai: Potato and kale parathas! I’ve always loved making rotis but have recently been making this variation. Boil and bake the potatoes then throw them in a bowl with the kale and add the spices: garam masala, cumin, cayenne pepper, and salt. For the dough it’s just chappati flour, water, and a little oil. Roll out the dough, create a pocket to add in the filling, re-roll then fry on a high heat (using a flat cast iron pan for best results). Good with a daal or chana (or even better when the kale’s organically grown from your allotment). Platt: In terms of effort to reward ratio, you can’t go wrong with padrón peppers. Just lay them on a super hot pan with oil until they’re blistered and black in spots. Then take them out, stick them in a bowl and toss them with more oil and coarse sea salt. It only takes about four minutes and they’re the most addictive thing in the world.